Optical Dynamics South African Distributor, Vision Machinery and Equipment, has been representing our company for nearly 19-years. This is a long relationship by any standards. Through the years, Dr. Chris Faul and his wife Pam have visited with Optical Dynamics team members Mike and Julianne in Louisville, and they have likewise visited South Africa. During these visits a true and lasting friendship has formed. 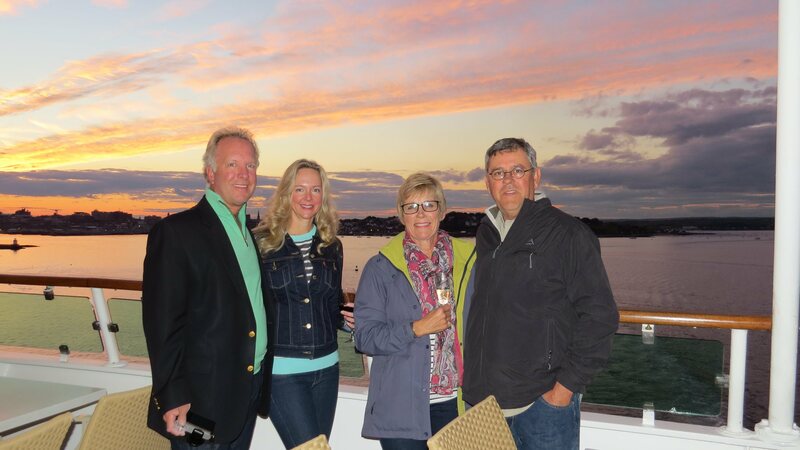 When Chris and Pam were in the States last month on vacation, Mike and Julianne met them in Boston for a week long cruise of the Eastern Seaboard. It was pure pleasure… ok, maybe a little business was discussed. This is a picture shared from their last night on board together departing Portland, ME. Mike & Julianne to the left, Pam and Chris to the right. What a beautiful sunset!